This small family-run hotel in New Smyrna Beach will ensure that your beach vacation will leave you feeling relaxed & rejuvenated. The staff is here to ensure that everything you could possibly need – from restaurant recommendations to planning outdoor activities – is simple and stress-free. Just contact the front desk and they will show you how to really vacation in New Smyrna Beach. 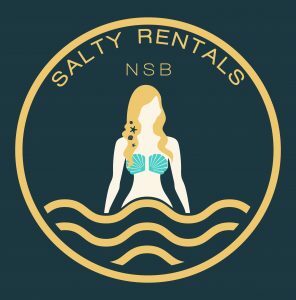 Salty Mermaid Hotel guest receive 10% off bicycle and golf cart rentals from Salty Rentals LLC. Contact the front desk to make a reservation today. Ride around town, or on the beach in the newest and coolest fleet of golf carts with pre-paid beach pass, bluetooth speakers, and custom painted graphics. Tour the town on bike with our awesome townies. Men’s and women’s available with 3 speeds, front and rear lights, adjustable seats, bottle holder, and combination locks. I would love the opportunity to work with you! Call me to discuss what you’re looking for. I’ve lived here for 7 years and have been coming here for 20+ years. I am very knowledgeable on the local real estate market. Visit: www.saltymermaid.myrandf.com to shop all products. Stop in the office and talk to one of our skin care Consultants 7 days weekly 9 am to 5 pm and get a free sample. Full display of products in Salty Mermaid Gift Shop. Add a 60 or 90 minute massage to your reservation by contacting the front desk. Are you planning to be a sinner or a saint while you’re in town? We will make a recommendation based on your answer.